Lychee Caramel Chocolate Truffles. 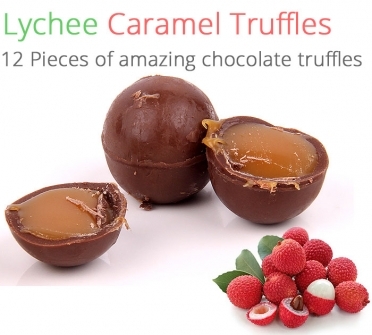 The unique combination of healthy lychee with caramel chocolate truffles. This is our one of best invention in chocolates with the combination of Lychee fruit. Just try for once you will fall in love with it. We make our caramel to make these chocolate truffles, everything is handcrafted and blend with the best mix of chocolate and caramel. You would not find such range of chocolate truffles any where in India. Chocolate mantra is proud to bring the best quality caramel chocolate truffles to Indian chocolate truffles. Chocolate Truffles, we call them as chocolate laddus in Indian version. They are soft outside and smooth and juicy inside. 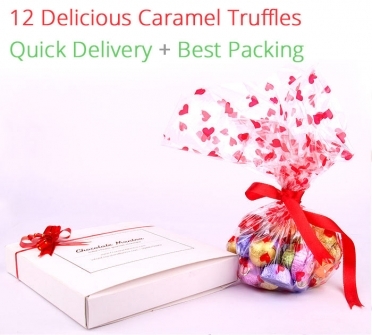 What you will get in this pack: 12 Lychee Caramel Truffles + Free Chocolate Samples + Free & Express Shipping. Delivery time: We deliver any order to any place in India within 2 to 5 working days. About the quality: Every chocolate is handpicked and packed nicely and have life span, taste and aroma up to 100 days. 1. We give free chocolates with every order, the quantity of the free chocolates is dependent on the amount of the order. 2. Once you receive our chocolate box, please keep the chocolates in refrigerator for 30+ minutes before eating them. We suggest you to store our chocolate in cool and dry places to preserve the best aroma and taste of the chocolate.